Do you struggle to get your kids to eat enough fruit? I have 5 words that may help them learn to love fruit and make it fun too: 'Put it in a smoothie'. My daughter regularly asks for milkshakes, so instead of offering her a strawberry or chocolate one, I offer her a fruit smoothy and she loves it. Why not offer a fruit smoothy, instead of sweet, processed milkshake flavours. 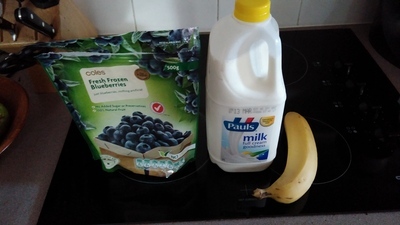 All you need to do is select what fruit/s you want to use, pop them and about a cup of milk in a bowl or Pyrex jug. Then use a bar mixer to puree the fruit and froth the milk. The pour and serve. I usually serve it with a straw, because this makes it fun and different. Smoothies are a big hit in this house too...it's amazing how much fruit you can pack in too.